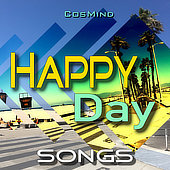 CosMinds exciting "Happy Day Songs" album features uplifting & happy moods, sunny, bright & bouncy Pop tracks with catchy male vocals & lyrics, composed & performed by the award-winning singer/songwriter Alto Rowan from Los Angeles/California. This awesome vocal album contains easy-going & ear-catching, fresh and youthful Pop-Rock-Indie-Folk songs from energetic, motivational and up-tempo to med-slow and dreamy for a perfect & happy day. Great songs for positive & optimistic vibes in film, documentaries, trailer, promos, movies, advertising, commercials, reality-TV, sit-coms to drama serials, daytime TV, ad campaigns.